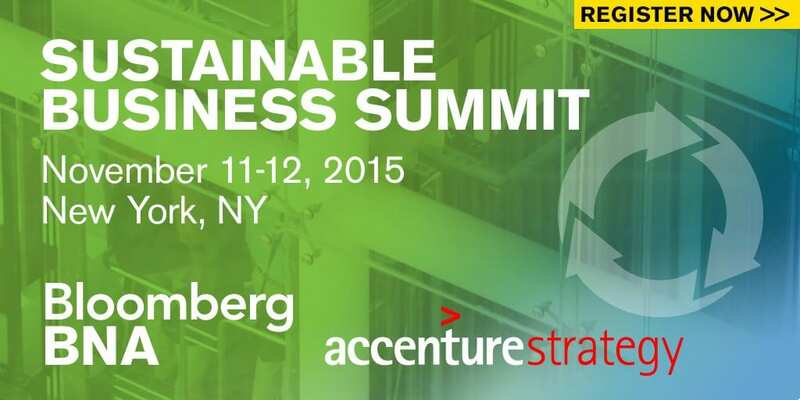 Sustainable Business Summit November 12 in New York City. Hosted by Bloomberg BNA, Bloomberg and Accenture Strategy. William McDonough was one of the featured speakers at the Bloomberg Sustainable Business Summit hosted by Bloomberg on November 12 in New York City. Hosted by Bloomberg BNA, Bloomberg and Accenture Strategy, the inaugural summit discussed how companies view the future and their ability to innovate through sustainable business models and processes. Day Two of the summit titled “New Frontiers in Sustainable Value Creation,” focused on corporate social opportunity, and how new sustainable business strategies are driving significant changes in sourcing, management metrics, and corporate performance.